FBTBForums.net :: View topic - Drum roll please... Steam Wars Winners Announced! Posted: Tue Feb 26, 2008 10:16 am Post subject: Drum roll please... 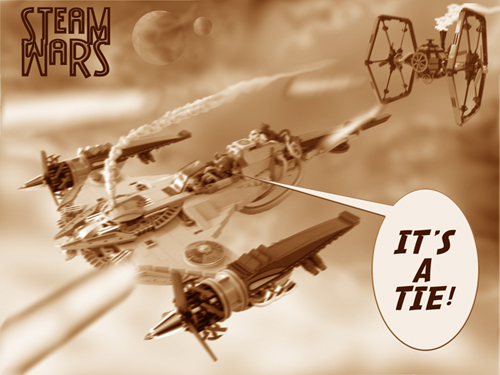 Steam Wars Winners Announced! Okay, I think we've held out for suspense long enough. Normally, we would have gotten this right out there, but in this case, there were some really phenomenal models, and a tie for first place! In the end, we decided to break up the tie with a staff vote. And the results are in... there was a winner! Oh, wait, you want to know who the winner was? Pwah. I just wanted to leave all (okay, some) of the fantastic prizes sitting in my closet! The voting for this was amazingly close. While I'd love to say we had overwhelming turnout on voting, we did have the highest voting turnout in some time. There were a ton of wonderful entries, and some great examples. This contest grew legs of its own, and flew all over the interweb. Builders were featured on Wired, Gizmodo, and even StarWars.com. The best thing was that it brought in a lot of new members, and more than that, our finalists ran the gambit from crotchety old members like Rocko to several "brand new" bothans! A Rebel Scout Speeder will be flying to you. Congrats to all the winners, entrants, and participants! But do you know what these numbers mean? 43% of the votes weren't for one of the winners! That the quality of these models was so high that we couldn't pick out a runaway winner is a great thing. Congrats again to all those who clicked the bricks for this one! Congrats to all, well done and cheers to everone who entered for making this such a pain in the patootie to vote for. Although if I'm honest, I think Ologs AT-sTEam should have been in the finalists. Although visualy stunning and wonderfuly built, I can't quite work out what irks me about ACPins model. But anywho, my $0.02 aside, this contest was fantastic, I can't wait for the next one. He did make it to the finals, but these are the top five after public voting. Posted: Tue Feb 26, 2008 3:22 pm Post subject: Re: Drum roll please... Steam Wars Winners Announced! Oh, wait, you want to know who the winner was? Pwah. I just wanted to leave all (okay, some) of the fantastic prizes sitting in my closet! Congratulations on all the excellent models. I wonder who forgot to start enough spam or lockable topics that the iron fist mods got this done. <: L O L :> Although it seemed rigged, the winners reflect the results seen during voting. Sadly, the thread mashing was confusing. Obviously, this represents a good portion of our active community. During the course of voting, new registrations were suspended, preventing anyone from "skewing" the results. Considering we opened voting on several great builds, I know it was tough to pick one. Hell, I could have cast a vote for every one of these models... Don and I basically did when we picked them. But it was all peer-reviewed, so no conspiracy. Ironic side note... the whole reason we held a staff poll was to avoid the conspiracy thing. That's why it took a bit longer to finish up. Both of the top vote getters offered to step aside for the other builder, so you know. Congrats to all you builders, winners and runner-ups! This was a fun contest. Dudes! Everyone of you! Amazing stuff. Well done to all. Congratulations to all the winners, your models are great! I noted that first and second places get 36 votes each, so how did you choose? I am not trying to create a controversy, I'm just curious. I'm glad Larry Lars placed! He got my vote! Great job with your trashy astro, Larry Lars! Thanks for the explanations, I didn't understood that part, sorry. As the Grail knight would say : "You have chosen... wisely". He lies, it was a cross between a ferret race and a game of lawn darts... don't ask. Bah, slander and falsehoods! They were stuffed lemmings and it was closer to a game of horseshoes played with ballista. Well however it was decided (and mighty intriguing those methods are,) thanks very much! I feel pretty amazed to win, I've placed highly here before (under my old log in as Mark Stafford) but never won. I can't praise the other entries highly enough, they were all magnificent! However it's RebelRock I feel most for - so close... sorry! Congrats to you winners though (and people who didn't win). I was hoping Servus I would mkae it to the winners circle, but all of you did a great job. Congrats to the top five! This was all around a pretty sweet contest. Thanks Don and dW, for attracting so much attention to our lovely hobby. And nice pic Nabii. Those two winners look great together. Oh and thanks for the sentiments regarding my entry, Xeta. It was thrilling to get the votes that I did get. Well, I wonder what the next contest will be. This'll be tough to top! Congrats to the winners They were all really well done. Though I'm abit suprised with some of the outcomes. Thanx again for hosting a great contest fellas and congrats to all the winners and participants. First and second were really good models, heehee, it's a TIE, I get it. I voted for the Imperial London Shuttle, but too bad Motian didn't place. Nifty Slave I variant he had. Location: The country where almost no conventions, celebrations or nothing, Australia. But congrats to all of you this was a really fun contest! we don't have enough like it. Gratz to the winners. I think larry's Y-wing should have won it looked the best. Ah well now you know who I voted for . Good job Don and dW, you made a great contest and without it I wouldn't be here. False! He used official LEGO rubber bands, which are elements in various technic sets and a few random system sets. Perfectly acceptable. Thanks for sponsoring this contest, Don and dW! Congratulations to both the winners, and to those who entered. I love the it's a tie poster, bring on the next contest! Congratulations to the winners! It must've been a tough choice for the judges, I know it was for me. The more important thing is that contests like these serve to galvanize the group and create an atmosphere of mutual inspiration and friendly competition.